It’s been another busy year for Earth expansion and palaeogravity, so it must be time to start our review of 2017. In Germany, the geologist Carl Strutinski started 2017 by releasing a new paper, Massenextinktionen aus Sicht der Hypothese eines wachsenden Erdballs (Mass extinctions with respect to the hypothesis of the expanding Earth), available as a free pdf. Strutinski published papers last year about the Lilliput Effect, gravity and mass extinctions and he continued these thoughts in his new paper. The Australian Institute of Geoscientists (AIG) had published an article detailing the evidence for Earth expansion in the December 2016 edition of AIG News, written by the Australian geologist James Maxlow. The first edition of AIG News in 2017 included an article arguing against Maxlow’s increasing radius Earth model (see page 11 of the 2017 edition of AIG News). Over in North America, the CNPS started to construct their Natural Philosophy Wiki consisting of 13,000 database items including scientists, books, and technical abstracts. They worked on various topics including expansion tectonics largely based on Dr. James Maxlow's website. Expansion tectonics at Natural Philosophy Wiki presented a number of very valid and pertinent questions that invariably arise. Some opponents of the expanding Earth theory (mainly internet based) constantly claim that the Expanding Earth Theory is dead, whilst their own views are established fact that should never be questioned. I noticed in February 2017 that a new science paper had been published in the December 2016 edition of the History of Geo- and Space Sciences, describing how these unscientific obituary reports of the expanding Earth theory were greatly exaggerated. Do Dinosaurs Pose a Gravity Problem? Do insect fossils disprove the theory of an isolated Indian subcontinent? Wenbin Shen and Sung-Ho Na, two Chinese scientists, considered, Atmospheric acceleration and Earth-expansion deceleration of the Earth rotation, in their new article. Secular deceleration of the Earth’s rotation is known but could Earth expansion also be a factor? SPACE NEWS decided to ask the question: Do Dinosaurs Pose a Gravity Problem? Author Ted Holden ("Cosmos in Collision") was asked to explore the controversial question. Scientists tell us that for about 165 million years on planet Earth, fantastic and often giant creatures called dinosaurs ruled our world. Of course, the largest of the dinosaurs dwarfs any animal that walks the earth today, yet consensus science tells us that earth's gravity was not weaker during the Mesozoic era. How is this so? Holden has been exploring his own ideas for a number of years and has never been in favour of Earth expansion even if the geological evidence for Earth expansion would predict the reduced gravity he has calculated. “Stephen Hurrell published a book on the subject of the Expanding Earth theory, available from sources listed on his website (link below). One of the longest running and most controversial theories in geology is the Expanding Earth theory. From the earliest school classes to the most advanced university geology lectures we are all taught that the size of the Earth has been constant and unchanging for thousands of millions of years, so virtually everyone is astonished when first presented with evidence for an Expanding Earth. Jan Koziar, a Polish geologist, has been updating a number of science papers and publishing them as digital copies, all freely available on the Wroclaw Geotectonic Laboratory website. In March 2017 he published a congressional paper, Falsification of the Eulerian motions of lithospheric plates, originally presented at the Polish Geological Congress (September 2016, Wroclaw). The original paper had also been published in a leading Polish geological journal. 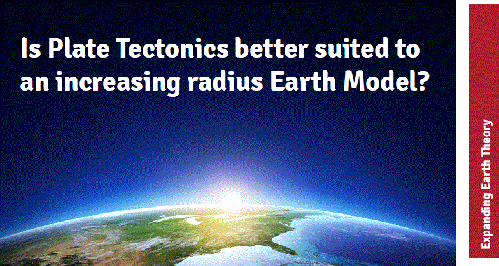 The New Concepts in Global Tectonics (NCGT) Journal began operating as a commercial enterprise. NCGT have published many articles about Earth expansion, as well as other non-mainstream views, so I'm sure everyone will wish them well in this new stage of their evolution. James Grist continued to work on his Growing Earth Simulation Software and placed videos of the simulated planet growth produced by his program on YouTube. One of James Maxlow’s talks made it onto YouTube as, Expanding Earth Theory - Growing Earth is Still Baffling Mainstream Science [FULL VIDEO]. I’d seen this video some time ago but I think this is the first time a copy had become freely viewable on YouTube. Konstantin Meyl published a paper in the Journal of Geology & Geophysics discussing an expanding Earth by neutrino radiation. A number of useful resources began to be hosted by Natural Philosophy. The concept of a Physical Explanation for Greater Earth Expansion in the Southern Hemisphere was highlighted. There was also an article about the “Amazing New Software Program for Expansion Tectonics” produced by James Grist. I also uploaded a video to YouTube showing a comparison of Plate Tectonic and Expansion Tectonic reconstructions from 0 to 120 Ma (million years ago). Both reconstructions use the same data but show a major difference in the development of the Mediterranean to Indian region. There was an interesting new study that seemed to disprove the widely held belief in an isolated Indian subcontinent. This paper didn’t suggest Earth expansion but Earth expansion also predicts India wasn’t isolated. 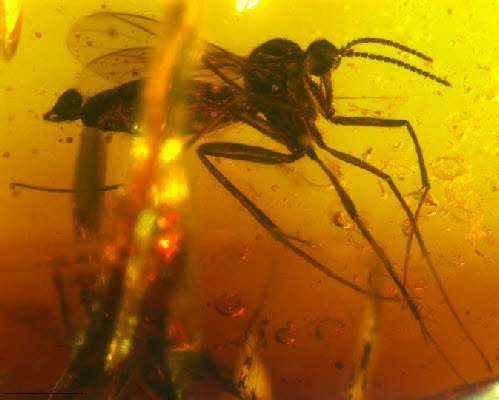 A new species of fungus gnat in Indian amber closely resembles its fossil relatives from Europe, disproving the concept of a strongly isolated Indian subcontinent. Researchers have identified three new species of insects encased in Cambay amber dating from over 54 million years ago. Another paper by two Indian geologists, Ghulam Sarwar and Yasir Shaheen Khalil, discussed The saga of India's drift and supra-subduction origin of the ophiolites on its northwestern margin, Pakistan. According to Plate Tectonics theory, in the aftermath of Gondwana rifting India drifted northward across a vast Tethys and collided with the various Eurasian blocks and arcs. There are, however, serious geological arguments against this concept. Karl W. Luckert, one of the long-time expansionists uploaded some of his videos to YouTube. The video "Four Theories of Earth Expansion and the Eocene Tectonic Event" was mainly from the conference held in Urbin in 2004. His book, Earth Expansion and the Eocene Tectonic Event, may also be available if you look hard enough. Jan Koziar, the Polish geologist, puplished a supplement to the paper, Falsification of the Eulerian motions of lithospheric plates, providing some additional explanations both in historical and methodical aspects. A few months earlier I had become fascinated by the Victorian polymathic scientist Alfred Wilks Drayson and his good friend William Thorp, a respected geologist and founding member of the Yorkshire Geological Society. In 1859, they speculated about the possibility of Earth expansion and presented the very first talk about Earth expansion to members of the Yorkshire Geological Society. Eventually, I published a paper about them, Early speculations about Earth expansion by Alfred Wilks Drayson (1827-1901) and William Thorp (1804-1860). It was a great pleasure to see James Maxlow, the Australia geologist, awarded a Lifetime Achievement Award (2017) by the John Chappell Natural Philosophy Society (CNPS). The Lifetime Achievement Award (2017) was bestowed on Maxlow for his work in geology, principally in developing Expansion Tectonics, including the generation of expansion models, in his lifetime pursuit of scientific truth. The press love stories about dinosaurs, especially if it includes everyone’s favourite dinosaur Tyrannosaurus rex (T. rex), so it’s no surprise that a new science study in 2017 was well publicised. The study shows a T. rex’s running ability was limited by the strength of its leg bones. The leader of the new study, Professor Bill Sellers from Manchester University, explained on BBC Breakfast how he started the study thinking he “would be able to show it would be a fast animal”. Unfortunately they found that T. rex couldn’t run in our present gravity. I took the opportunity to briefly explain how T. rex could run in a reduced gravity. CNPS 2017 was announced as a success in the report of the event. The most interesting for me was: Day Three – Other Models, Math, and Expansion Tectonics, Lifetime Achievement Award. The talk by John Eichler, A New Mechanism for Matter Increase within the Earth, was also added to YouTube. A paper published by Dennis McCarthy, Geophysical explanation for the disparity in spreading rates between the Northern and Southern hemispheres, was made more freely available. This noted that an interesting characteristic of the Earth, often noticed by schoolchildren, is that it seems out of balance: Oceans dominate the Southern Hemisphere, while continental crust seems to be crowded into the Northern Hemisphere. The cause of this inequity involves the greater number of mid-ocean spreading ridges and significantly faster spreading rates in the Southern Hemisphere. The problem of India within the Plate Tectonic theory was raised again in the new paper, Collision of Indian Plate and Indus Tsangpo Suture Zone: Some Geological Constraints, by Zahid Ali Khan (Directorate of Geology and Mining, Khanij Bhawan, Lucknow, India), Ram Chandra Tewari (Department of Geology, Sri Jai Narain (P. G. College, Lucknow, India) and Rabindra Nath Hota (Department of Geology, Utkal University, Bhubaneswar, Odisha, India). Alan Sparx decided to write a general article about: Getting bigger: The intriguing idea that the Earth is expanding. He asked: Is Australian geologist Dr James Maxlow, this century's Alfred Wegener? The concept of Earth expansion obviously continues to intrigue young geologists. This year Maxlow’s books were in the top hundred section of Amazon Geophysics and his early book, Terra non firma Earth, was often No 1 in Geophysics on the Australia Amazon bookshop throughout the year. In November I noticed that my interview by Greg Moffitt had reached 10K views so far for the YouTube upload alone. I also enjoyed myself producing a short YouTube video: Why were dinosaurs so big? A brief introduction to the reduced gravity theory. Jan Koziar also placed another comprehensive paper “Expansion of the Earth and its proofs” Unfortunately this was only in Polish but it was interesting to note that the topic had formed a lecture in May 2017 at Wroclaw University interdisciplinary Studium Generale and was very well received. Finally, there was an early Xmas present for us all to enjoy. A video presentation about Earth expansion by Prof. S. Warren Carey was uploaded to YouTube. This video was from 1982 and I never even knew it existed. I wonder what other goodies we might discover in the future! Carey’s first book about Earth expansion, The expanding Earth: developments in geotectonics, had been published a few years previously in 1976. Two more books would follow. 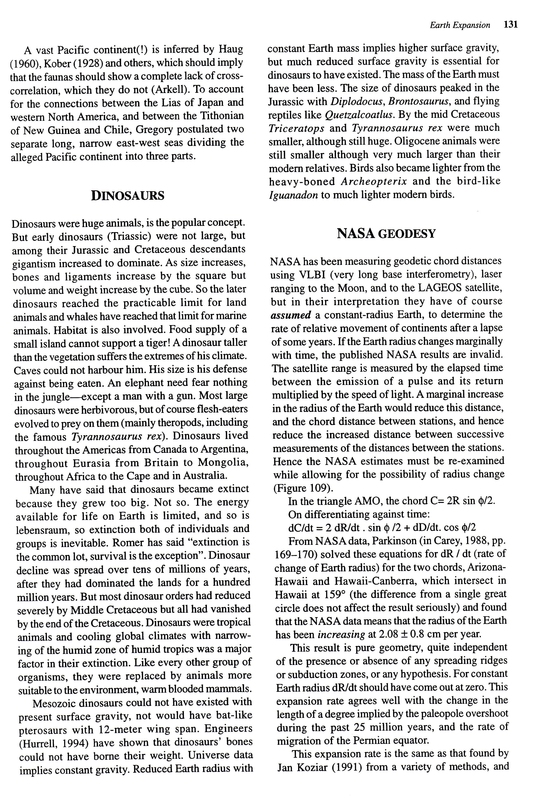 In 1988 Carey published a book aimed at a more general readership, Theories of the Earth and Universe: a History of Dogma in the Earth Sciences. Then in 1996 he published his book, Earth, Universe, Cosmos. All Carey’s books are still available. The most recent, Earth, Universe, Cosmos, is available from the Tasmanian University. The University also has a monument to Carey. I hope you’ve all had a wonderful Xmas and I wish you all a Happy New Year.